This evening a drone with camera flew onto my property outside my bedroom and hall windows on Oakwood Ave. It’s my understanding that they must be registered with the FAA and adhere to their guidelines. Also, flying into someone’s backyard or filming through a window can get you into legal trouble. There are some existing state laws about trespass and/or peeping tom laws. Drones!! Drones everywhere. They’re no longer just for the military. Drones range in price from $20 to $3,000+. They take awesome pictures, can take some amazing videos, and are just plain fun to fly and use. You can even find drone races! However, as these high tech devices get more popular it becomes more important than ever to understand your responsibilities as a drone flyer and your rights as a resident. First, the question on everyone’s mind, can I shoot it down (Welcome to America)? Let’s start with a quick definition: Unmanned Aircraft System (UAS) or drones are aircraft without a human pilot aboard. Your Frisbee is not a drone, your quadcopter that’s radio controlled is! 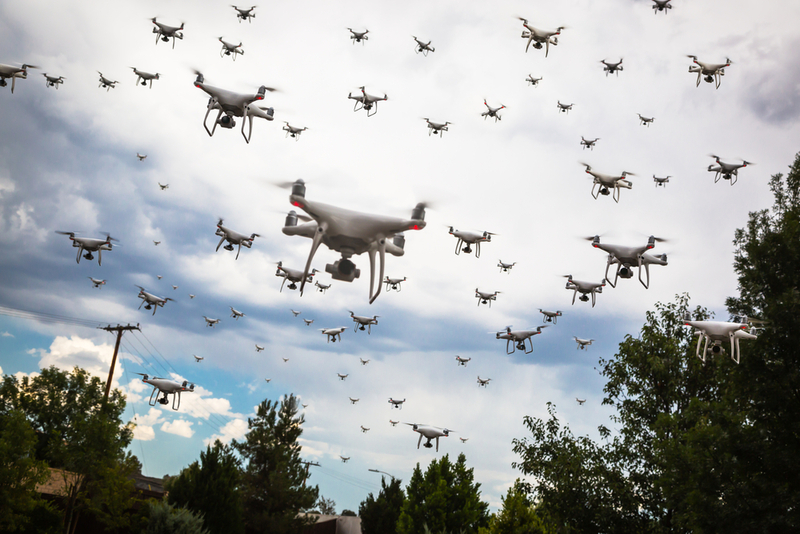 Newsweek magazine reported a case of a teenage girl sunbathing in her backyard when she saw a drone equipped with a camera hovering overhead. Her father got a shotgun and shot it out of the sky. He was arrested and charged with unlawful purpose and criminal mischief. If you get a chance, check it out, it is a great read and one that should give you pause before taking matters into your own hands. In our minds, it also shows that our laws aren’t quite caught up with current technology. Another regulation to be aware of is the Aircraft Sabotage statute (Aircraft Sabotage -18 U.S.C. 32) which the FAA has cited in regard to drone shootings. This statute makes it a federal crime and felony to shoot down or harm a drone and/or a drone operator. You can read more HERE and HERE The flip side of the FAA’s statement is that no one, as far as we could tell, has been prosecuted under this statute for actually shooting down a drone. You’re more likely to get in trouble, like the first case, with local law enforcement. The Laws: So why do we need to regulate and register these devices? Because of the potential to invade people’s privacy, interfere with large aircraft and, if you watch South Park, cause unnecessary mischief. Federal: You must register drones that weigh more than .55 pounds and less than 55. “If your drone weighs more than two sticks of butter, you should register it”. Registration is limited to U.S. citizens and legal permanent residents. If you’re using your drone for commercial uses, then there’s a longer, older paper-based system. It is unlawful for any person to knowingly and intentionally cause an electronic device to enter the property of another to secretly or furtively peep or spy or attempt to peep or spy into or through a window, door, or other aperture of any building, structure, or other enclosure occupied or intended for occupancy as a dwelling, whether or not such building, structure or enclosure is permanently situated or transportable and whether or not such occupancy is permanent or temporary; or to do the same, without just cause, upon property owned by him and leaser or rented to another under circumstances that would violate the occupant’s reasonable expectation or privacy. A violation of this section is a Class 1 misdemeanor. The provisions of this section shall not apply to a lawful criminal investigation. Local: Recently a drone was spotted flying over the space that VCU Medical Center uses to transport critically injured patients. This has led to a push for even more regulations regarding unmanned flights in Virginia. Who owns the airspace above private property? Did you ever think to ask yourself this question? Since the time airplanes were invented a century ago, this question has been one that a lot of citizens haven’t had the need to consider. However, with drones exploding into the zeitgeist, this question is something we should all know the answer to. Drones are full of cutting-edge technology. If you’re anything like me (Jacob) you’re constantly amazed at the innovation that surrounds us and this is just one more example. Drones can be a fun hobby, a tool for artists, and even a vehicle for those with a competitive spirit. However, it is important, no matter what you’re using your drone for, to use common sense! Observe local, state, and federal laws while having fun and please, try not to creep out your neighbors. I am always one to rely upon human ingenuity to solve these sorts of problems. A rifle is not only potentially dangerous but a bit barbaric (and firing one is, I believe, illegal in many cities). So, I am confident that someone will come along and develop some technology (such as an “Anti-drone Laser” or “Electronic Drone Incapacitator”) that a homeowner can order (on Amazon, of course) and safely cripple any hovering drone. I’m always conscious of privacy when flying. Straight up, about 400’, then on toward exploration. Unless, of course, I’m inspecting roof damage for someone. Thank you.. This was a very positive post and honest review about drones and what you should know . As a Part 107 operator and aerial business owner we keep ourselves in check and follow all rules and regulation. Unfortunately, others do not follow that even as a hobbyist. State: In Virginia, it’s not super clear where flying is allowed legally. As a general rule, you may not fly within a 5-mile radius from any airport. You will see no mention of where you cannot fly a drone within 5 miles of a Airport. While I cannot say who “owns” the airspace above your property, the FAA claims “exclusive jurisdiction” over “national airspace”. The FAA is the sole authority when it comes to use of national airspace, and as such, FAA restrictions are the only ones that are legally enforceable nation wide. A critical distinction needs to be made between where a pilot flies “from”, as opposed to where the drone itself flies. Property owners can restrict pilots from launching or operating drones from their property, but only the FAA can restrict the use of the airspace itself. Even other Federal Agencies defer to the FAA in all matters regarding use of national airspace. For example, the National Park Service has acknowledged that the restriction against flying drones in National Parks only applies to the launching/landing (piloting) of drones from INSIDE park boundaries…NOT the use of the airspace above the park by pilots physically standing outside a parks boundary. Said another way, there is no FAA restriction against flying over National Parks, and the National Park’s do not restrict the use of the airspace…only the operation of a drone by a pilot physically standing on park property. In the same light, no property owner, be they State, County, Local or Private can legally restrict the use of the airspace above their property. So, back to the beginning – Who owns the airspace above your property??? For all intents and purposes…the FAA, and only the FAA! I would catch it with a net then sell it back ? In the interest of full disclosure, I should add that while the FAA alone can restrict one use of any airspace, that does not mean that a pilot can fly irresponsibly with impunity just because the airspace is not restricted. Laws against peeping, electronic surveillance and the like are still fully enforceable. Using the space above National Parks as an example, while you can legally fly over a park, it is still illegal to harass wildlife, disturb breeding or migratory activities, etc. The lack of a restriction against using an airspace does not convey any right to misuse an airspace. Fly responsibly! So, while one is not strictly prohibited from flying within 5 miles of an airport, one can only do so in conformance with FAA regulations that apply to class B, C, D and E airspace. Splitting hairs by stating “there is no mention of where you cannot fly within 5 miles of an airport” only serves to sew confusion. 😉 I live in Virginia.. and am very familiar with the laws. It also helps that I only have one/two neighbors within useable drone range… and i know they don’t operate drones. An FAA authority to “regulates” drones, does not provide the FAA to authorize use of private airspace. Similarly, the EPA has no authority to enter your dwelling to clean your sink and toilet (although in some cases they should).